In accordance to celebrate the World Hypertension Day in May 2017, PERKI has performed the blood pressure measurement simultaneously in one full month until June 2017, whereas one of the venue was held at Head Office of PT. Otsuka Indonesia on June 7th, 2017. The theme of this year is: “Know Your Numbers” which means everybody should acknowledge their own blood pressure measurement whether it is normal or abnormal. Therefore, all employees of Head Office and Jakarta Branch of PT. 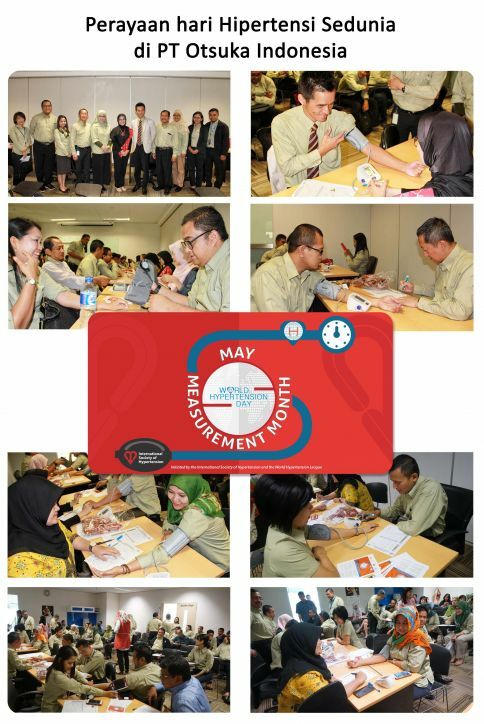 Otsuka Indonesia who joined the blood pressure measurement simultaneously could reach the awareness of their own blood pressure. This is important to increase awareness about importance of blood pressure measurement regularly. Also, to increase knowledge about healthy lifestyle.